One year ago, I was at the first-ever Guerrilla Storytime at ALA in Chicago. It was there that I met IRL librarian Kendra Jones, who shared her parachute song with attendees in response to a challenge. I've used the song several times since then--it's simple, mentions the colors on the parachute, and gives something to move around to with the parachute. 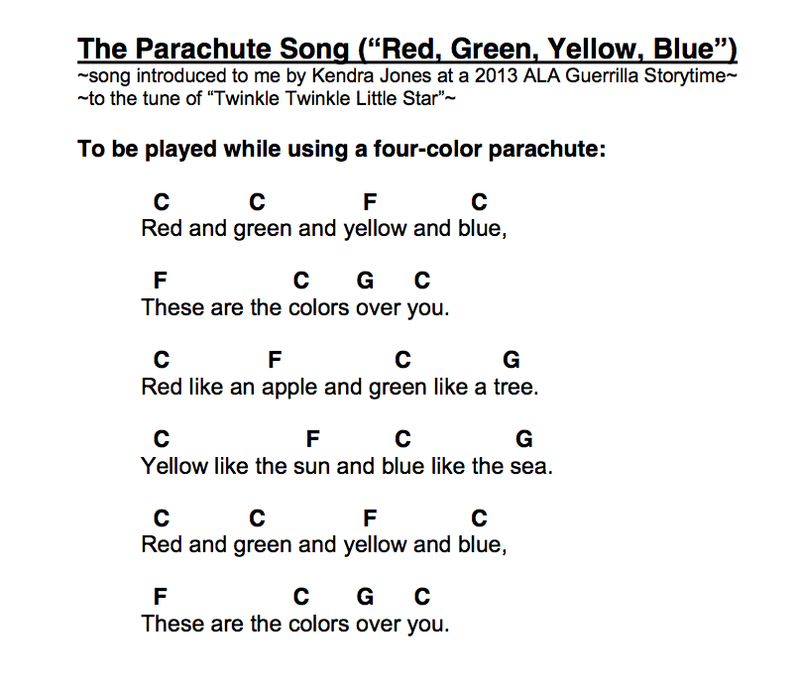 I just recently started playing the song on the ukulele when there are enough caregivers in a program to manage the parachute without me. I'm in Las Vegas over the next few days for the 2014 ALA Annual Conference. I'll be attending plenty of sessions and events, and I'll be doing my best to share as many of those as possible over on the ALSC Blog, where I'm on the slate of live bloggers for the event. So if you couldn't go to Vegas, or if you're here but looking for info on sessions your schedule wouldn't accommodate, head over to the ALSC Blog periodically to see what's been going on! I'll have a full conference recap here after the event, but you'll definitely want to check out the live blog during the conference. Not too long ago, we hosted a Ballet Story Time at my library, to great success--lots of families were excited to attend a program with a real, live ballerina in attendance, ready for questions and pictures. So, of course, I wanted to figure out a way to replicate that same enthusiasm for another audience of library families. The result? Soccer Story Time. The St. Louis Lions are a local soccer team in the Premier Development League, and our library district has worked with them on a number of occasions for special events in the past. They were happy to be able to come to my branch for a specialty program. Here's what we did. Soccer players love to read, too! I welcomed everyone to our event and reminded everyone about the summer reading program. Plenty of kids were already signed up for summer reading, and a handful had seen the Lions at our summer reading kickoff event earlier this month. Then it was go time. This story, and its illustrations, share a soccer tale that many kids can relate to. We see Pelé as both a young soccer enthusiast and as a professional player, enjoying everything about the game the entire time. The message that playing for the love of the game--as opposed to a love of winning--is a good way to conclude, too. We started with a chance for the kids to ask our four attending soccer players questions: about when they started playing, how much they practice, etc. After the questions had been answered, the players demonstrated a few trick moves for the crowd before breaking the children into groups for some basic soccer skills practice. The youngest in the crowd worked on kicking, older kids did dribbling and other moves. Then, we concluded soccer time with a good old-fashioned shoot-out. The professionals were the goalkeepers and the kids tried to kick goals. My, were they having fun. I had a simple soccer ball craft set out on tables at the back of the room to help keep folks interested as they waited their turns for autographs and photo ops. 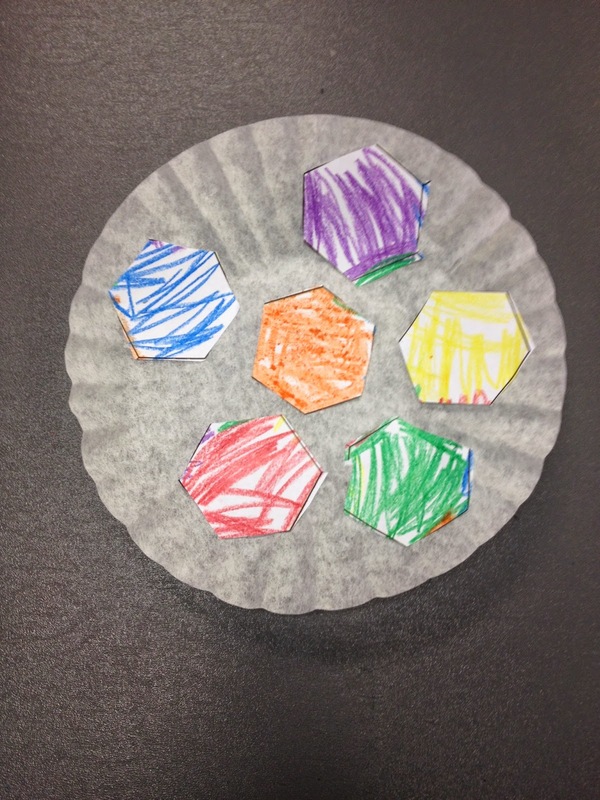 The craft used a hexagon template I created, which allowed kids to color in the hexes, cut them out, and glue them on a coffee filter. Ta-da! 2-D soccer ball. Everyone had a great time at this program, with many of the attendees psyched to go see a St. Louis Lions game this summer. I think World Cup fever helped the interest level, too, as well as the general ubiquity of kids in soccer around these parts. All things considered, this was a straightforward and enjoyable way to tap another aspect of the community for a library program. Last week, I took advantage of two newer additions to my library district's programming supplies to offer a school-age STEAM maker program. I had sent to my branch one of our mobile computer labs--8 laptops, plus an instructor laptop, so those of us without dedicated program computer lab space can offer computer programs--and a kit of MaKey MaKeys, and a group of 9-12 year olds and I set to creating our own computer games with the added excitement of using the MaKeys to play them. Here's what we did. To get things started, I introduced how circuits work; completing a circuit is key to getting the MaKeys to function properly, so the introduction seemed apt. From there, kids opened their MaKey MaKey kits and we started to attach the alligator clips to the board. With a MaKey MaKey, you can turn anything that will conduct electricity into a computer key. We used paper clips attached to an index card to help keep everything orderly. Getting the MaKeys set up took a few minutes, but pretty quickly the kids were able to figure out how they could complete their circuits and get their MaKeys to function. They were experimenting with their setups and playing the default MaKey games before I knew it. After a half hour of MaKey setup and experimentation, we moved on to the portion of the program where we created computer games. We used Scratch--which, I found out during the program, about half of the kids had already used in school programs. Scratch is a free, web-based, visual programming platform created by MIT, and it offers lots of options for creating computer programs at varying levels of complexity. We set out to create simple maze games in which the player avatar--called a Sprite in Scratch--navigates a pathway using the arrow keys until reaching the end and finishing the game. I had created a sample maze before the program, and I projected the game's scripts onto a blank wall to provide examples of ways to make a maze game. I moved from child to child for about 45 minutes, coaching them on creating their game backdrops; the next steps in their programming; talking about x and y axes; asking questions to help them think about how they could tell the game to do what they want, etc. After trial and error and lots of tinkering with their code scripts, the kids were able to get their games to do what they wanted. With the Scratch games in working order, the children plugged their MaKey MaKey apparatuses back into their laptops so they could use their paper clip keys to play their games. Several of the kids tried one another's games before their parents rejoined us in the room, at which point it was great to hear the kids explaining what they'd created and to see them guide their parents through playing their games. I heard lots of feedback that the kids would be continuing to experiment with making Scratch games at home. That's a sign of success for a maker program, if you ask me--kids learn new skills and discover new interests that they'd like to continue to pursue. One of my favorite lesser-known folk tales is "Toads & Diamonds," a Cinderella variant in which our good and deserving heroine ends up with plenty of lovely things and kind friends while her toad of a mean sister ends up with, well, toads, among other things. If you're unfamiliar with this story, allow me to recommend Charlotte Huck's version, illustrated by Anita Lobel. When I adapted this story for a flannel board, I created flannel pieces to give a visual to the jewels and slimy creatures with which the fairy in the story "gifts" the two girls. That means that I'm doing straight oral storytelling for the setup of the story, with the flannel pieces starting about halfway in. I've found that this story is plenty captivating for most audiences preschool and older--a good story keeps you interested regardless of what there is to look at. I will say, when I tell this story, I modify the ending a bit. Instead of the kind sister ending up getting married to a prince, the jewels her dowry, I tell a version in which she ends up venturing out on her own and finding true friends--people who respect her for who she is, not what she has. Let's call it my feminist re-envisioning. 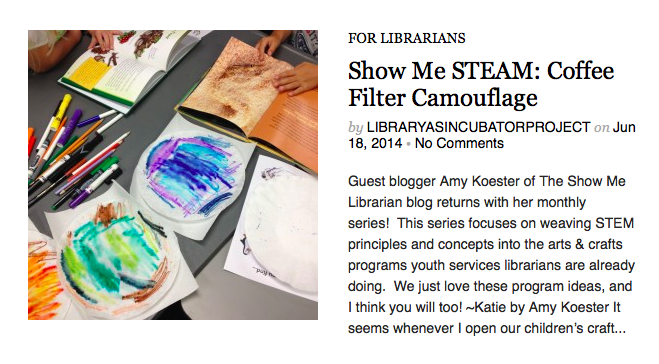 Check out this week's full Flannel Friday roundup on Hannah's blog Lovin' the Library. I'm over at the Library as Incubator Project today sharing details of a camouflage program I offered at my library recently. We hacked the traditional coffee filter craft to add the science behind camouflage, and everyone had a great time. Head over to the Library as Incubator Project to take a look at the full program plan! Taylor, S.S. The Expeditioners and the Secret of King Triton's Lair. illus. by Katherine Roy. McSweeney's McMullens. 23 Sept. 2014. p. 384. When we last saw the three West siblings--Kit, M.K., and Zander--they had had quite an adventure: discovering a treasure hinted at by a secret map given to them by their father; letting a bully of a young explorer take credit for finding the treasure; safely securing another secret map hidden at the cache; and gaining entry to the Explorers Academy. You'd think life might be somewhat calm after such an experience, but not so for the Wests. The stakes of success at the Academy are ever higher now that the threat of war looms for the United States and its Allied Nations, and Kit is struggling to crack the secret map he and his siblings discovered in Arizona. Some sleuthing leads him to discover that this map points him to a place called King Triton's Lair, but figuring out the location is only a small part of this new quest. You see, all ships trying to pass through King Triton's Lair have sunk. And if you try to avoid this treacherous stretch of sea, you'll still have to contend with the pirates. 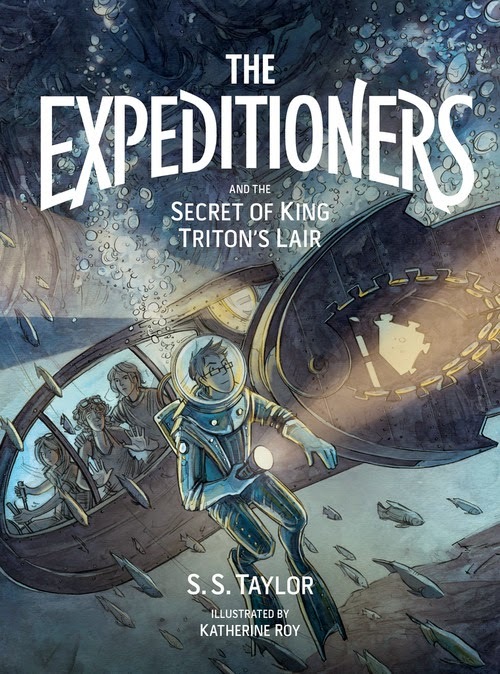 It's been about a year and a half since I read Taylor's first installment in this Expeditioners series, and I found myself quickly pulled back into the reimagined modern world that she's created. It's full of interesting Newly Discovered Lands, strange and wonderful creatures, and a whole host of places and animals to discover--a perfect setting for any explorer. The feelings of a surveillance state and the warmongering in the government have only grown, with some of the Wests' immigrant classmates detained for questioning after an assassination attempt on a high government official. The mood created by this backdrop for the main story makes this second novel in the series equal parts adventure and menace--in other words, a story that will pull you in just like the mysterious forces acting in King Triton's Lair. I also particularly appreciate the character development in this sequel, especially with regard to Kit; Taylor could easily have just relied on the characterizations she created in the first novel, but she really allows her characters to mature in their relationships and their perspectives. A lot more is happening in their world and quest than the Wests ever knew--and it's a treat to ride along with them. I have a handful of readers who absolutely loved the first novel, The Expeditioners and the Treasure of Drowned Man's Canyon, and I cannot wait to hand them this second installment. I think there's high demand right now for great adventure and exploration titles like this, especially considering the popularity of such series as the Superstition Mountain books, which are great readalikes for this title. The Expeditioners is an excellent steampunk adventure series with tons of heart and appeal. Being a children's librarian in an ever-growing community means a consistently bustling story time schedule, both in the library and for outreach visits. To keep my material fresh and exciting for me, and thus for the kids I'm reading with, I like to pick new books to share pretty regularly. I've had great success with a handful of books in particular lately, and I wanted to share them with you (in case you're looking for something to save you from reading that same go-to for the millionth time this month). Don't Push the Button! by Bill Cotter - This silly story is just begging for you to push the big red button. When you finally do, plenty of interesting things ensue. As will delighted laughter. 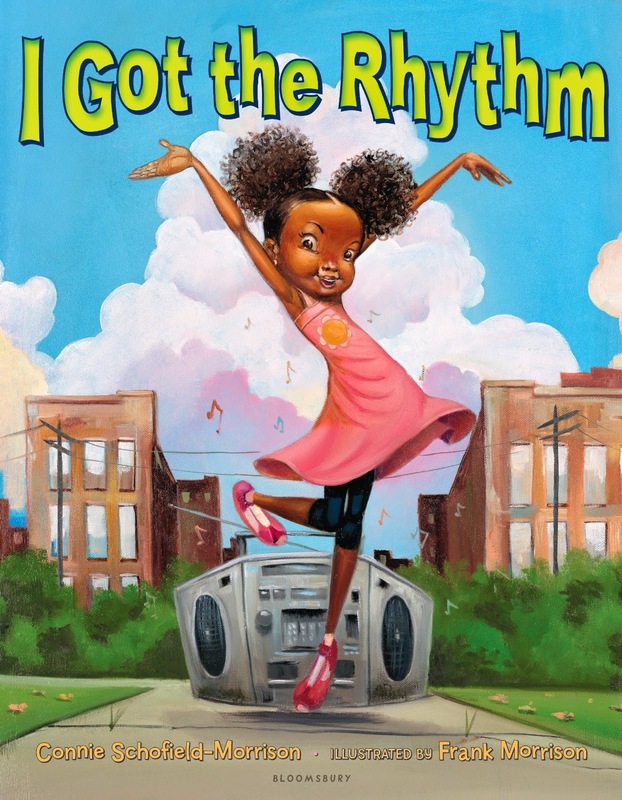 I Got the Rhythm by Connie Schofield-Morrison and Frank Morrison - A girl steps out of her home and immediately catches the rhythm of everything around her. It's impossible to not move along to the beat of this text, and the words invite plenty of great action. 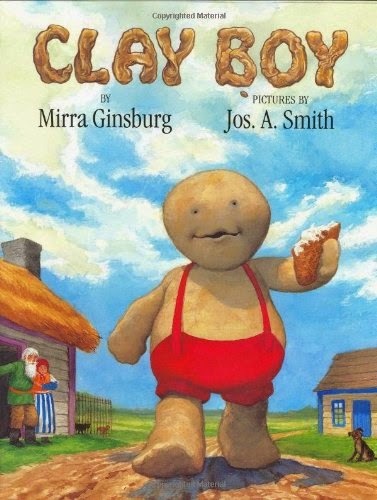 The diverse children depicted in the illustrations make this an exemplary story time choice. 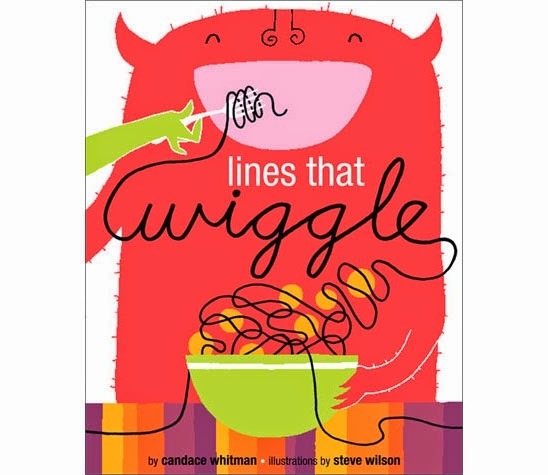 Lines That Wiggle by Candace Whitman - This title was brought to my attention by a post on The Library as Incubator Project, where Jayne Gammons talked about sharing this story while having kids wiggle their bodies the way the lines on the page are wiggling. I've been having kids wiggle their fingers along with the story, to great success. 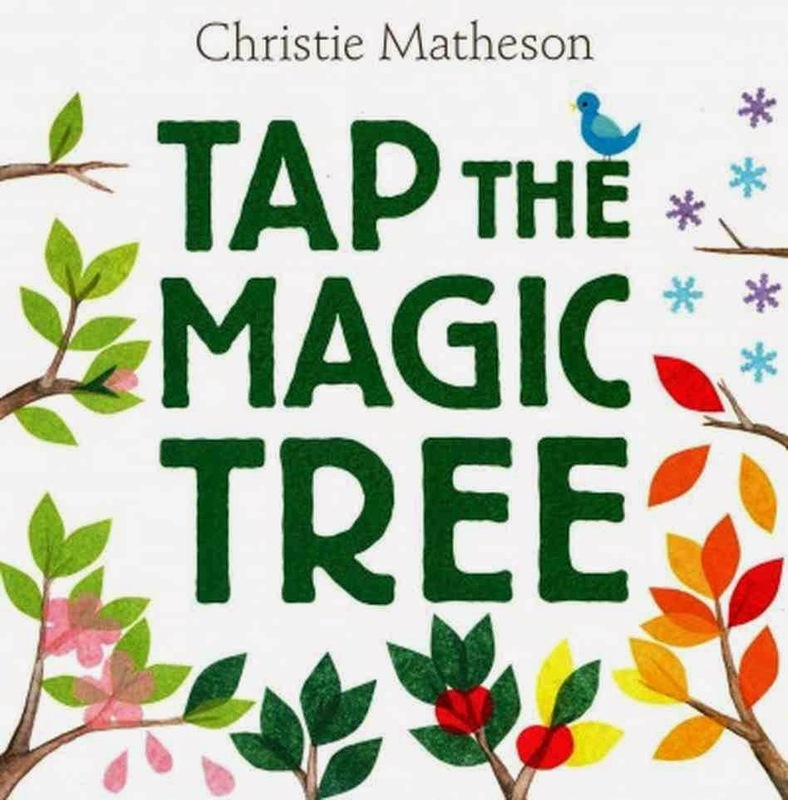 Tap the Magic Tree by Christie Matheson - Follow a tree through the "magic" of the seasons, from bare branches to buds, flowers, and apples, before the leaves change colors and blow away. Kids have a look of wonder when I've shared this book, and it invites plenty of talk about seasons and the life cycle. 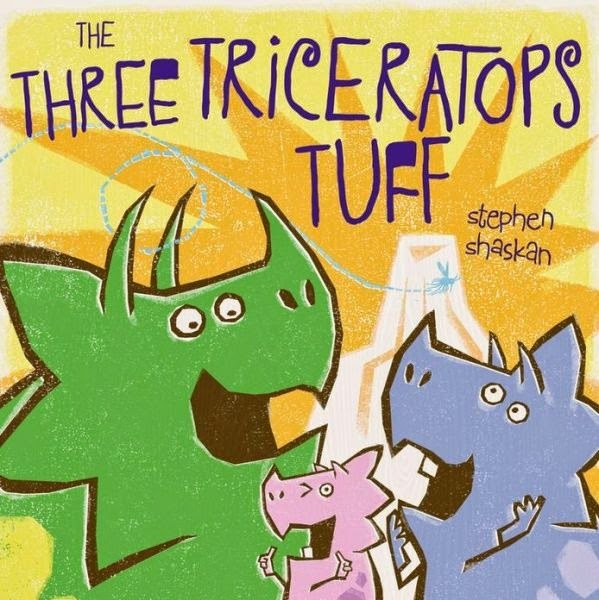 The Three Triceratops Tuff by Stephen Shaskan - This dinosaur retelling of the Three Billygoats Gruff is a great, well-paced read, with an opportunity to give yourself short T-Rex arms. Side note: When I read this story, I rename the biggest triceratops "Babs" instead of the written "Bob," because why should all the dinosaurs only be boys? What have been your recent favorite story time reads? At the end of April, while I was struggling as a reader, I decided to spend a few hours of my vacation in a Reading Spa at Mr. B's Emporium of Reading Delights, a fabulous indie bookshop. At Mr. B's, you reserve your Reading Spa in advance, giving their staff some info about your personal reading tastes. This allows them to pair you, the spa recipient, with a well-read staff member who has similar tastes, thus upping the chances of said staffer being able to make recommendations that the spa recipient will actually like. The Reading Spa itself starts with a 30-45 minute chat in which the recipient talks about books, authors, themes, etc., they like, while the staffer take notes and asks clarification questions. Note: At no point in the conversation does the staffer make title recommendations. Once the conversation is over, the spa recipient is given some tea and cake while the staffer heads to the bookshop stacks to pull recommended titles. Upon collecting piles of books--my Reading Spa included 25 recommended titles--the staffer returns to the spa-goer and book talks each title, making sure to note why they thought the reader might find said title interesting. The Reading Spa concludes with the spa recipient left on their own to browse the recommended titles and make decisions about what books to take home from the experience. For me, this Reading Spa was pure luxury. It was wonderful to be on the other end of talking about books--me sharing what I like as opposed to me being the careful listener of others' tastes. Having full freedom to talk at length about my reading tastes led me to discover things about myself as a reader that I had never consciously realized. For instance, that I am a science fiction fan. I never would have self-identified as a sci-fi reader, although considering what I love to read, yes, that makes sense. Also, without talking about lots of books I've enjoyed, I wouldn't have been able to easily put my finger on the fact that I particularly enjoy narrative structures in which multiple characters share narrative duties. I had previously read maybe half a dozen such books in a year, but had never overtly realized that I have a preference for this style of narration. I left with a stack of 15 books--enough that I needed to check two bags on my flight home instead of one--all of which I have been thoroughly enjoying. But I also left with some thoughts on reader's advisory. The three big ones follow. Readers often don't know what kind of readers they are. Especially young readers. Quality reader's advisory takes time. I'm talking about those reader's advisory interactions where a customer comes to the desk and says, "I'm looking for something good to read." Not for class, not for a project, just for fun. These true reader's advisory interactions take time, because you need to have a conversation about books and that customer as a reader. A full conversation. I think that, since reader's advisory so often happens at the reference desk, we have gotten into a habit of treating reader's advisory requests like reference questions. That is, the customer provides the query, and we provide the response. One-two and done. That's not going to be sufficient for quality reader's advisory, for helping readers find lots that they'll enjoy reading. Quality reader's advisory means starting with a basic response question--"What are some books that you have enjoyed?" --and encouraging the reader to keep talking from there. Quality reader's advisory means the staff person asks questions to deeper understand a reader's preferences, but does not interrupt the reader's answers with suggestions. Suggestions come only after the reader has finished detailing their reading life. And on that note, please notice that I say "suggestions" plural. Because quality reader's advisory will not leave the reader with just one book to try next. Quality reader's advisory will leave the reader with a whole host of possibilities for reading, able to be perused and enjoyed over the course of several months and subsequent library visits. Reader's advisory isn't a one-and-done service, not when done right. One staffer cannot be an expert on every genre or format. One of the most transformative aspects of my Reading Spa experience was that I got to talk to someone who likes the same types of books as me. That may seem obvious, but it doesn't always happen in reader's advisory interactions at the library. So much of the reader's advisory training I see in libraries involves bringing staff up to speed on every genre so that we all have five go-to titles to recommend in any given reader's area of preference. That's good to satisfy those reference-style RA questions--I need a historical fiction for my book report--but not so much for quality reader's advisory. I think libraries need to take more of a slow food approach to quality reader's advisory. That is, it won't all happen instantaneously via whoever happens to be staffing the desk when the reader comes in. Think of your staff instead as artisans of different genres and formats. If a customer comes in wanting animal stories, direct that customer to your staffer who enjoys and thus reads animal stories. Know and use your staff reading expertise. The reader's advisory interactions that follow will be that much richer and successful because a person who knows what they're talking about is serving as guide to a reader with similar tastes. The resultant recommendations will be better, and customers will be happier. My Reading Spa experience has left me ruminating quite a bit on what reader's advisory does and looks like in the library setting. 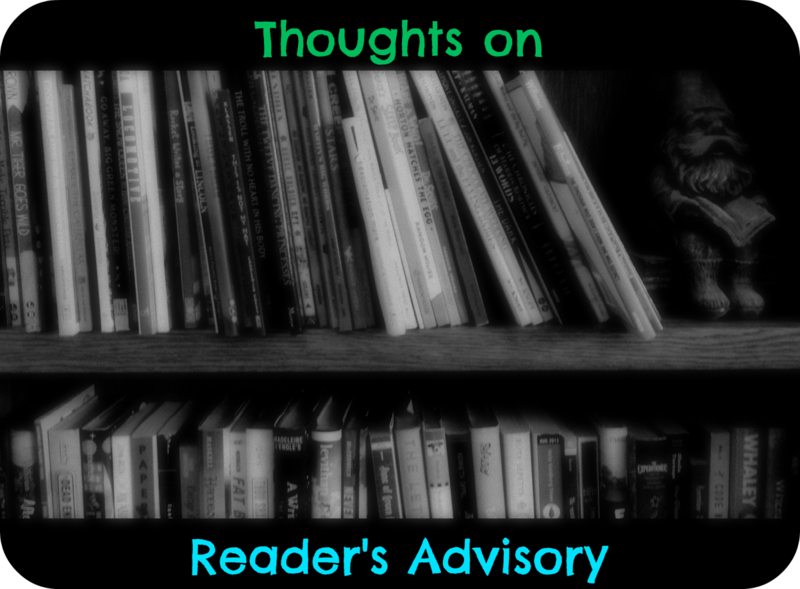 How do you use reader's advisory to truly support your readers as opposed to just making sure they leave with a book? 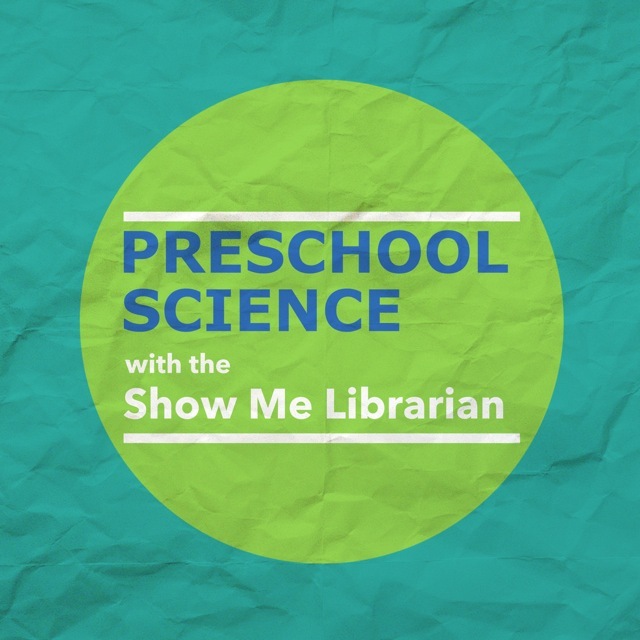 I'm over on the ALSC Blog today sharing the details of my most recent Preschool Science program. In that program, we explored all sorts of things having to do with magnets, from a story to experiments to activities. 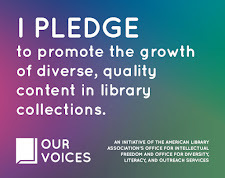 For full details, head over to the ALSC Blog! Summer reading is in the air here in St. Charles County; despite my local school district still being in school until Friday (thanks, snow days! ), we're off and running with our annual summer reading program. For the second year in a row, my branch helped kicked things off through our partnership with St. Charles Parks & Recreation. This summer marks Year Two of our Picture Book Walk at Quail Ridge Park, a local county park with a number of paved trails, one of which boasts 17 beautiful, handmade signs displaying the entirety of a picture book, spread by spread. For details on the "hows" of the project, check out my post on the topic from last summer. This year, the book around the lake trail at Quail Ridge Park is the immaculately illustrated Berlioz the Bear, by Jan Brett. The introductory sign encourages wandering readers to pay special attention to what's going on in the illustrations around the edges; Brett is known for fitting intricate visual storytelling in every space of the page. While this book doesn't have as explicit a connection to nature as last year's choice (The Curious Garden by Peter Brown), I chose it for the walk because it invites leisurely reading. The buildup of the story, the visual interest, the climax of the story--they all lend to a relaxing stroll along the trail while enjoying a great book. These eight activity stations were ongoing throughout the two-hour event, with a special performance halfway through the kickoff by one of the park rangers. He shared and passed around a huge range of animal pelts of creatures indigenous to Missouri. Kids had a great time feeling the different furs and seeing the range of sizes of these animals. Most recognizable by far: the skunk. I had teen library volunteers to help staff the library's activity stations, as well as some assistance from my colleague Miss Melanie at the summer reading signup station. The library could not have offered so many activities at the kickoff without their help. In the course of the two-hour kickoff event, we shared reading and recreation with just over 200 people, mostly children and their families. We got tons of folks signed up for summer reading, and we generated a ton of excitement about returning to the park to experience the Picture Book Walk again. The Berlioz the Bear installation will be up for several months, hopefully giving every interested family a chance to experience it. If you happen to be in the Wentzville, Missouri area this summer, I do hope you'll stop by! Welcome back for the latest installment of Common Core IRL (In Real Libraries), a blog hop featuring outstanding librarians and bloggers Mary Ann Scheuer at Great Kid Books, Alyson Beecher at Kit Lit Frenzy, and Cathy Potter and Louise Capizzo at The Nonfiction Detectives. Our goal: to provide examples of and facilitate thinking about what the Common Core State Standards look like in real libraries. Children across the United States usually encounter basic information about Colonial America when they learn about the First Thanksgiving, usually in preschool or in kindergarten. More in-depth learning, however, takes place in the older elementary years, when students encounter a (hopefully) more nuanced historical perspective. By supplementing this factual learning with historical fiction read alouds, children can engage in a deeper understanding of the time period and what it was like to be a Colonial American. I've divided the read aloud titles discussed in this post into two age ranges: grades 1-3, and grades 4-6. 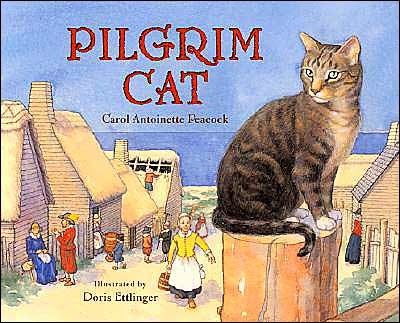 This picture book conveys the story of Anne Hutchinson and her family, Puritans who arrived in the colonies only to experience further religious persecution. Anne had strict religious beliefs about inclusiveness, rights of all community members to preach, and non-violence, for which she was ultimately banished from colonial Boston. 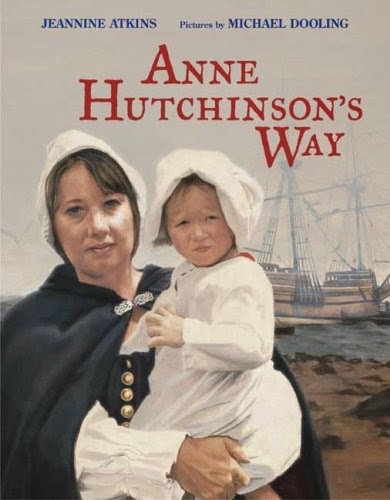 The story is based on the life of the real Anne Hutchinson and her family. Anne's perspective on faith and what is right is clearly very different from male colonial lawmakers, and the story provides opportunities to connect to standard RL.3.3, which focuses on describing characters and how their traits and actions contribute to what happens in the story. This picture book follows a young girl, Faith, as she journeys on the Mayflower and endures the first year at Plymouth Rock, culminating in the First Thanksgiving. She shares the experience with a cat whom she discovers on the Atlantic voyage and names Pounce. Faith and her fellow colonists encounter Samoset and Squanto, Wampanoags who may be familiar to young readers from their previous Thanksgiving lessons. The illustrations do much to convey the amount and variety of work that went into staying alive on the journey to and in the new colony, connecting to standard RL.2.7, which emphasizes using information from both words and illustrations to demonstrate understanding of the contents of a text. 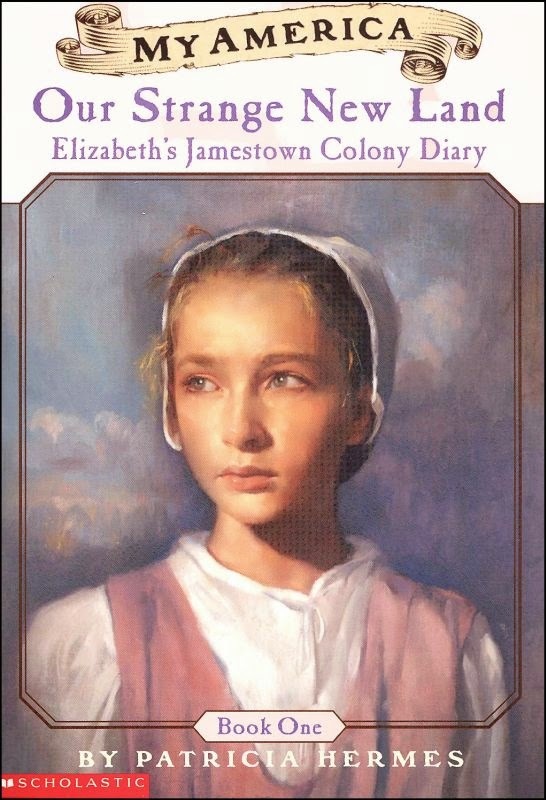 Part of the "My America" series of fictional first-person historical diaries, this book (and its two sequels) allows readers insight to a young girl's perspective of the day-to-day struggles and new experiences associated with living in Colonial America. A number of historical figures, like John Smith and Pocahontas, make appearances in the storyline, allowing readers to make direct connections to historical facts they learn in social studies lessons. The diary format of this book provides ample opportunity to explore pacing in storytelling. This exploration fits with standard RL.5.5, which deals with understanding how a series of chapters (or, in this case, diary entries) creates the structure of a story. *A note about read alouds on the topic of Colonial America: As I did some research to locate a variety of historical fiction titles that could fit this Common Core IRL topic, I discovered that there is something of a void in this area of literature for children. Most of the books I found were published before 2000, and of these, many were culturally insensitive--a disproportionate number added drama through tales of abduction by Native Americans. While abductions did occur in Colonial America, these texts overwhelmingly depict Native Americans in stereotypical and harmful ways. The majority of the more recent titles I found deal specifically with the American Revolution; while a worthwhile topic on its own, life during the American Revolution was not the same as life during the Colonial period between 1620 and 1775. There is a real dearth of high-quality children's historical fiction set in Colonial America. Given the ubiquity of the topic in school curricula, one would hope that authors and publishers will rectify this lack of sensitive and compelling Colonial America stories.